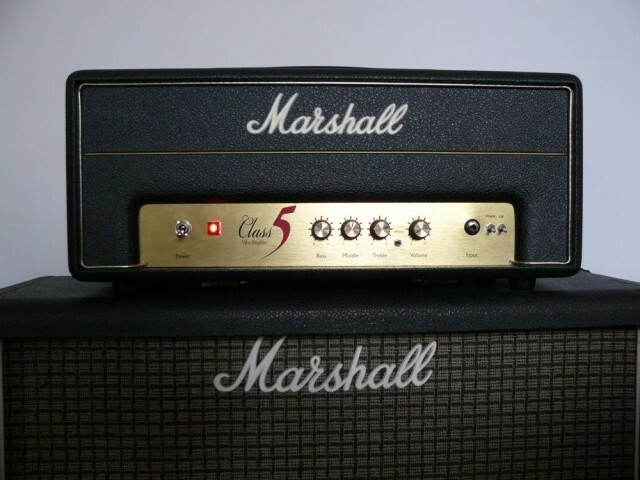 Marshall Class 5 Mods | It-11 Audio / Tonegeek"
I read a very interesting post from Lyle Caldwell (Psionic Audio) on the Les Paul Forum, and implement some mods he proposes. This entry was posted in Amps and tagged Marshall Class 5, mods. Bookmark the permalink. Hi, that’s cool and yes, oscillations can be pain in the *, really ! Be careful with lethal voltages inside amps, if you try ! Those 470pF treble boost caps are sometimes more trouble than they’re worth. I used a single 150pF across R12, and a 120pF across the volume control, and that’s it. That parasitic, ultrasonic “fizz” is apparent with any larger values. I also bolted in a larger output transformer, and the choke, and I’m getting a lot more than 5W out. Good luck with it, everybody. Cheers. 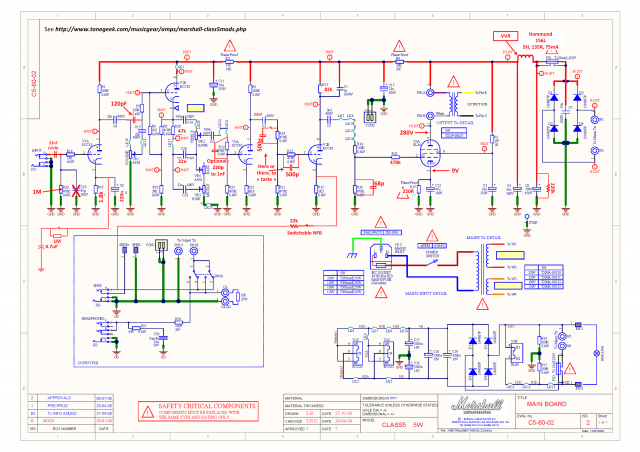 Thanks for posting your blog and the Class 5 schematics, much appreciated! You note above you’re looking for more “PLEXI”, so I’m wondering are these mods based on the 1959? Without assuming so, I would still ask, why not move the tone stack at least one gain stage later, or even create a “true” cathode follower and move the stack to the final gain stage? Or, turn the Class 5 into the 2204 “cascading” circuit using the first two gain stages? It seems the designers were trying to compensate for the early tone stack placement by adding a final gain stage after a tone recovery stage, but, as you point out, putting the 470k/470pf network (you use 500pf in the MODS schematic) so late in the amp will not really duplicate the raspy sound of the 2204, which puts it after the 1st gain stage and before the Volume control. Please excuse me if these suggestions/queries are out of line. I expect to acquire a Class 5 this week and may find when I do that the PCB designers, in their wisdom, have made it impossible to move the tone stack, which would nip my intentions in the bud. But, then again, at the end of the day, if one is willing to break some traces and do some hard wiring, it might be possible to turn the Class 5 into a Marshall after all. No, not really a 1959 ! Thanks guys, glad to see people are enjoying the mods. On the amps I mod for clients, I do change the entire circuit to that of either the Plexi (Normal and High Treble with all the proper gain staging) or JCM 800 (cascaded gain etc). But that involves cutting traces, longer shielded runs, etc, and unless you really know what you’re doing the end result is a butchered PCB and a ton of oscillation. The mods I shared are ways to improve the stock circuit for about $10 in parts. Hi, looking at the schematic, I don’t get how the speaker is still connected in low-power mode on the Class5. It looks as if the 15R power resistor is only connected in this mode. Am I missing something, or is it still connected through the headphone/speaker jacks? I want to build a higher-power Class A amp with an 807 tube with the same switchability. Thanks! I fear to ask…. but how does one purchase / acquire a Class 5 head ? I’m not finding any major dealers who carry it…. $350 is a great price, apparently it’s a hot item. theyre no longer available new, Marshall stopped production in 2012. I was lucky enough that my local GC found one, new in a sealed box, tucked away in their storeroom and I was in the store when it was found. I bought it on the spot and got it for used price! I got the combo. Hi, you did a great job and thanks for sharing. 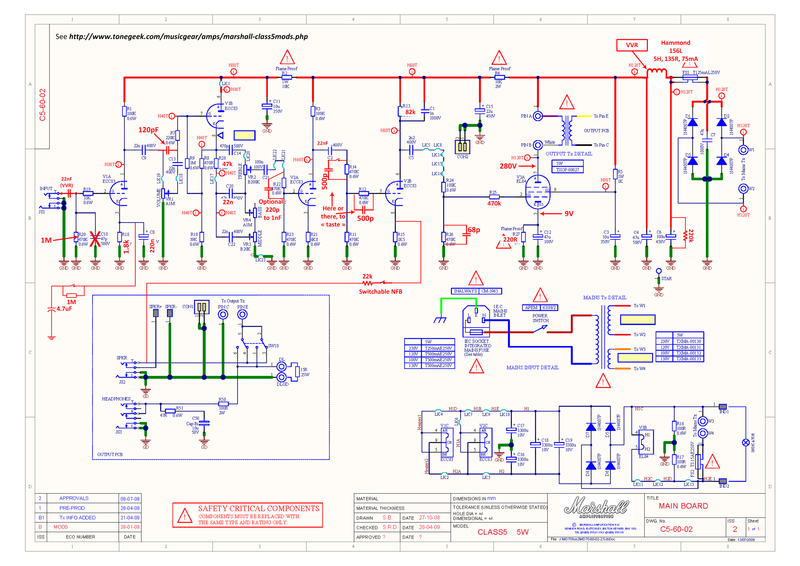 I need to know if someone could tell me what kind of component are all those LKs on the schematic. I do strongly suggest changing C11 out for a 22uf cap. It eliminates a tendency for the amp to ghost. And on the first version Class 5s with the tubes mounted to the main board, the input signal at R19 is routed really close and parallel to the plate signal coming off C9 with no shielding between them. This causes a lot of bleed and even oscillation. Remove R19 and R20, cut the trace back at the jack, put a new 1M across the jack (replacing R20), and run a shielded wire from the jack to a new 33K resistor (replacing R19) soldered to pin 2 of the socket, above the board. This eliminates this bleeding and oscillation. Will do, Lyle. This “ghosting” problem manifests itself as a fizzy sounding tone immediately after certain (higher register) guitar notes, I assume? Thanks for all, Lyle ! Glad to see your take on Lyle’s mods. One thing I don’t get is, on the original mods Lyle wrote for MLP, there’s a new wire going from SW10 to R51, and I don’t get what is the use for this? I mean, if you put sw10 on the headphone position and that you insert your speaker cable halfway, so it’s only connected to ring and sleeve, you already have the attenuated sound. So I really don’t get what this mod is made for, while I understand everything else. You’re right, I don’t know why he does such a thing ! I get it! With that mod you can use the headphone output as the 1w output with only the flip of a switch. You can still use the headphone output if you want to. Great mod, I guess it’s on the combo only. Has anyone plotted the frequency response of the amp (tone pots at 50%) before and after the mods? It would be nice to see the overall effect. I have just made a clone of this amplifier (for a friend who wants to use it as a harmonica amp) and have included some of the mods as well as a few of my own, and must say the amp appears to be very stable although this could be because I’m running a lot lower B+ supply and this leads to my question(s). What are the voltages as measured either side of the HT dropping resistors, and I’m intrigued by the bias arrangement for V1B? On my amp this appears to be way off but this could be due to multimeter impedance? Thoughts and suggestions would be appreciated. Lower B+ voltage ? This was one of my customer’s amps, so I don’t have it anylonger to check … I would say current through R6 is approx 60mA ?